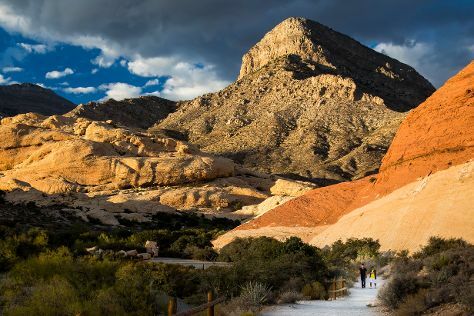 Start off your visit on the 30th (Sun): take in breathtaking views at Red Rock Canyon National Conservation Area. On your second day here, look for all kinds of wild species at Lake Mead National Recreation Area, then get a taste of the local shopping with The Strip, and then don't miss a visit to Bellagio Fountains. To find ratings, other places to visit, traveler tips, and tourist information, refer to the Las Vegas online trip maker . The Route module shows you travel options from your home to Las Vegas. In June in Las Vegas, expect temperatures between 103°F during the day and 77°F at night. Finish up your sightseeing early on the 1st (Mon) so you can go by car to Death Valley National Park. Kick off your visit on the 2nd (Tue): contemplate the long history of Harmony Borax Works, then cruise along Artists Dr, and then explore the striking landscape at Zabriskie Point. To find maps, photos, other places to visit, and other tourist information, read our Death Valley National Park travel route site . Getting from Las Vegas to Death Valley National Park by car takes about 2.5 hours. Other options: take a bus. Traveling from Las Vegas in July, Death Valley National Park is little chillier at night with lows of 73°F. Finish up your sightseeing early on the 3rd (Wed) so you can go by car to Mammoth Lakes. Mammoth Lakes is a town in Mono County, California, the county's only incorporated community. On the 3rd (Wed), explore the striking landscape at Devils Postpile National Monument, then indulge your thirst for a good beer at Mammoth Brewing Company, and then contemplate the waterfront views at Lake Mary. To see traveler tips, maps, more things to do, and more tourist information, you can read our Mammoth Lakes trip itinerary planning app . Drive from Death Valley National Park to Mammoth Lakes in 3.5 hours. Alternatively, you can do a combination of car and bus. While traveling from Death Valley National Park, expect slightly colder days and cooler nights in Mammoth Lakes, ranging from highs of 83°F to lows of 46°F. Wrap up your sightseeing on the 4th (Thu) early enough to take a bus to Yosemite National Park. Escape the urban bustle at Cathedral Beach Picnic Area and Mariposa Grove of Giant Sequoias. Spend the 7th (Sun) exploring nature at Bridalveil Fall. There's much more to do: take in the dramatic natural features at Glacier Point, take some stellar pictures from Tunnel View, get to know the fascinating history of Big Trees Lodge, National Historic Landmark, and don't miss a visit to Yosemite Conservation Heritage Center. To see more things to do, reviews, maps, and tourist information, read Yosemite National Park trip itinerary planner. Getting from Mammoth Lakes to Yosemite National Park by bus takes about 1.5 hours. 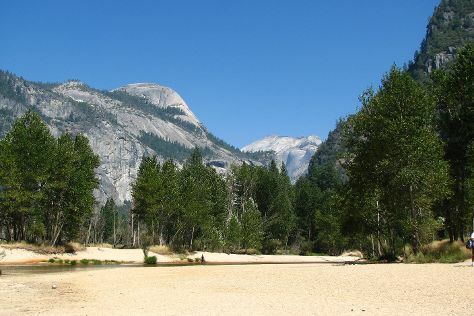 In July, daytime highs in Yosemite National Park are 83°F, while nighttime lows are 46°F. Finish your sightseeing early on the 8th (Mon) so you can travel to Soledad. Soledad is a city in Monterey County, California, United States. Start off your visit on the 8th (Mon): explore the striking landscape of Pinnacles National Park. To see more things to do, photos, maps, and more tourist information, refer to the Soledad trip planner . Explore your travel options from Yosemite National Park to Soledad with the Route module. When traveling from Yosemite National Park in July, plan for little chillier days in Soledad, with highs around 71°F, while nights are somewhat warmer with lows around 56°F. Finish up your sightseeing early on the 9th (Tue) so you can travel to Sequoia and Kings Canyon National Park. Visiting Giant Forest and Grant Grove will get you outdoors. Visit Manzanar National Historic Site and General Sherman Tree for their historical value. There's lots more to do: explore the striking landscape at Moro Rock, trek along Buena Vista Peak Trail, tour the pleasant surroundings at General Grant Tree Trail, and explore the stunning scenery at Kings Canyon National Park. To find ratings, more things to do, where to stay, and tourist information, use the Sequoia and Kings Canyon National Park online journey planner . The Route module can help you plan travel from Soledad to Sequoia and Kings Canyon National Park. Traveling from Soledad in July, you will find days in Sequoia and Kings Canyon National Park are warmer (98°F), and nights are somewhat warmer (66°F). Wrap up your sightseeing on the 12th (Fri) to allow time to travel to Channel Islands National Park. The coast of Southern California might be one of the most densely populated areas of the United States, but a quick hop out to Channel Islands National Park provides a picture of coastal living in the region before human development. On the 13th (Sat), look for all kinds of wild species at Channel Islands National Marine Sanctuary and then step off the mainland to explore Santa Cruz Island. To see other places to visit, where to stay, ratings, and more tourist information, read Channel Islands National Park travel route planner. Explore your travel options from Sequoia and Kings Canyon National Park to Channel Islands National Park with the Route module. Traveling from Sequoia and Kings Canyon National Park in July, expect nights in Channel Islands National Park to be a bit cooler, around 60°F, while days are cooler, around 75°F. Wrap up your sightseeing on the 13th (Sat) to allow time to travel back home.